The Following Finale Review: How Did It All End? Well, that was an intense, wild ride to close out the series! 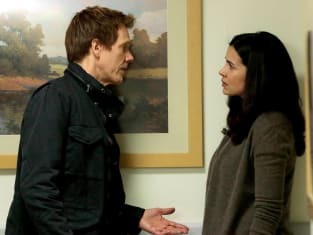 Chances are if the writers had known this would be the final episode, The Following Season 3 Episode 14 would have ended a little differently. Are you satisfied with how it all turned out? For a season finale, I thought it was pretty great, but it left me wishing for more episodes. I can't fault the writers for leaving it open for a possible season 4, and it definitely could have been worse. I was really worried it was going to end without us finding out if Ryan survived the fall. We don't know if Theo survived. If Ryan and Mark can both survive major falls into treacherous waters, I don't see why Theo can't. Granted, he's at a bit of a disadvantage with the whole gunshot wound to the head thing. I'm not sure how he managed to just jump right up after that, but this is TV. Earlier in the season, I expressed concern that Gwen might turn out to be one of the bad guys. I changed my mind recently, and I'm glad they didn't go there. I have to say though, I was pretty surprised when Lisa turned out to be working for Eliza. Did anyone see that coming? After Joe's death, Ryan began his descent to the dark side. It looked like Gwen's pregnancy was going to bring him back from the deep end, but things took a turn when Theo targeted her. Ryan's conversation with Max in the car was heartbreaking to hear. He believed for a moment that he could have a family and be happy, but that was all shattered thanks to Theo. Ryan sneaking into the hospital to visit Lisa was the nail in the coffin. He questioned her for details on Eliza and he killed her without remorse. If this show were coming back, could Ryan still be saved or is he too far gone? I don't get it. How can you feel so much love for one person and feel absolutely nothing for anyone else? His doctor analogy didn't really make any sense. Doctors try to save people. Yes, they lose some, but that's not the same as purposely killing them. The first hour brought Gina back into the mix, which was nice. For as smart as Theo is, he didn't give Ryan much credit if he didn't think Ryan would smell the trap. Like Ryan said, why would Gina be working the case after leaving the agency weeks ago? It would have been nice to get confirmation on whether or not her wife survived, but I'm going to ahead and assume she did. Did they mention it and I missed it? Max was on an emotional rollercoaster throughout the two hours. She was feeling guilty over not being fast enough to save Mike and not telling him she loved him. She spent nearly all her screen time either in the hospital worried about Mike, or trying to find a missing Ryan. It ended with her believing he's dead. That's rough. At least Mike survived though! It was touch and go there for awhile, but I never actually thought he would die. If they were going to kill him, they wouldn't have dragged it out the whole episode. If I had one complaint, it would be that I really wish we could have gotten a fight scene between Max and Daisy. I was disappointed when she just turned around and shot her. At least Max got her revenge for being beaten with a two by four, but still, it would have been better if she'd gotten a few punches in first. What did you guys think? Are you bummed that we're left without a happy ending for Ryan? We can all pretend that he went off and took out Eliza and came home to Gwen, right? I would love if Hulu or Netflix saved the show, but I'm not getting my hopes up. If you missed any of the action, you can watch The Following online any time. Max: I tried to get my gun out, but it happened so fast. He saved my life and I just sat there. Gwen: You did everything you could. Gwen: I know it's difficult for you, Hardys don't understand. Some things are out of your control. This wasn't your fault. Wrong. I want your whole entire family. Permalink: Wrong. I want your whole entire family.